Good eating habits and a love of learning both start early, and what better way to instill both in children than with a garden? Gardening with preschoolers not only engages children in hands-on learning, but begins to build positive experiences with healthy food. This is why school gardens are a key component of effective Farm to School programs. Farm to School can include local food included in school meals, farm field trips, school gardens and cooking local food, but the goal is to rebuild connections between children and the food they eat. Proving positive social reinforcement for healthy eating, Farm to School offers children the opportunity to grow their own vegetables, learn about farms in their community and have first-hand experience preparing fresh local food. 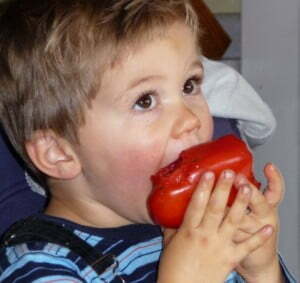 The more connections and positive experiences children have with fresh healthy food, the more likely they are to eat it. This is the philosophy (and the experience) of ASAP’s Growing Minds program. School gardens, farm field trips, and cooking with young children are three of the strategies we enlist to build positive relationships with fresh, healthy local foods. As an educator, these strategies can simultaneously be powerful tools to enhance language development, literacy, mathematics, science, creative arts, social and emotional development, as well as physical health and development. The key to successful Farm to School programming is integrating local food and farms throughout curriculum areas, offering students real life context for learning and discovery. Many teachers are intimidated by the thought of gardening with young children because they have not gardened themselves. Yet, someone who has never grown food in a garden may be the ideal person to garden with children because they are able to authentically model the learning process. Observing teachers take risks in trying something new, handle mistakes, and problem solve are valuable learning experiences for all children. Some adults that have been gardening for years have the misconception that young children won’t be able to “do it right”. A children’s garden should be focused on the experience of gardening rather than the result. While it is important for the garden to produce something, maximum production and neat rows can be sacrificed to give children the opportunity to participate in all steps of the process. Just as it takes some time, flexibility and creativity to allow for child directed and inquiry based learning, this is also true for gardening with young children. Planning – Young children can be involved in every stage of planning a garden from where to put it, to what is planted. Planning is wonderful learning opportunity as well as important step in building ownership of the garden. Have children discuss what plants need to grow and try to identify a garden site that would meet those needs. Students can experiment with different measuring tools, counting how many “feet” long the bed will be, or using rulers and tape measures. Flag or rope off the garden area so students have a visual of where the garden will be. Seed catalogs can help students start thinking about all the different things they could grow and are great materials for making collages of their dream garden. Read garden related children’s literature to “research” what types of plants children could grow. Preparing the beds – This is a hard piece for preschoolers alone, but is a great way to engage parents and community members. Have students brainstorm all the people in the community that could help and organize a garden work day. Although adults will do most of the work, make sure students are still involved and get to “help”. Planting – Have a plan before you plant. Try to let children do as much of the planting as possible. Use baking flour to mark places for children to plant. Planting itself won’t take very long, engage other children with watering and soil exploration. Labeling – Marking and labeling plants can help create a language rich environment. Make sure the materials you use will hold up to the elements. Child created signs will help build ownership of the garden. Structures – Children of all ages love garden structures. From bean tee-pees to scarecrows, garden structures are a wonderful way to create opportunities for dramatic play. Care – Caring for a garden is a great way to teach responsibility and basic needs. When establishing new seeds and plants, water is the most important piece to successful growth. Integrate garden maintenance and observation into your daily routines. Sprinkle baking flour on garden plants and let children pull up everything else. This is a perfect opportunity to create charts, make predictions and track growth. Have children make a list of questions about the garden as they arise. Have a “Garden Expert” visit the class to answer questions or help problem solve. Harvesting – Everyone’s favorite part of gardening. Establish rules/guidelines about harvesting, such as everyone can pick one thing each day or creating a special “harvest time”. This ensures there will be enough for everyone and that things won’t be harvested prematurely. When there is not enough for everyone to harvest, supplement with product from a local farm. Putting to bed for the winter – Fall clean up and preparing a garden for the winter is another great time to enlist community help. Cleaning out the garden beds and planting a cover crop will make your garden more aesthetically appealing through the winter months and make spring bed preparation a lot easier. You can even plant an edible cover crop, such as Austrian winter pea, for children to nibble on throughout the year. Incorporating the garden into the classroom – Think about ways to integrate farms and gardens into centers throughout your classroom. Make sure food, farm and garden children’s literature is available in the classroom to answer children’s questions and inspire new ideas. Try to include fruit and vegetables that grow locally or are growing in the garden in the dramatic play/housekeeping area. Include garden discoveries in the science center. Use old seed or garden materials in art projects. Enlist students to help brainstorm ideas. Cooking is a natural connection and an important next step in reconnecting students with where their food comes from. This can be as simple as a taste test or as complex as having a parent or chef come into the classroom to facilitate an activity. Gardens are an engaging outdoor learning environment for children. Offering multi-sensory experiences and opportunities for inquiry, we know that gardening is good for physical, social-emotional and cognitive development. The challenge for educators is designing these areas well and learning how to use them as developmentally appropriate teaching tools to meet classroom goals and objectives.